More display, less power. Finally the moment has come: The new Apple MacBook 12 faces our tests. Read all about our first results and get a first taste of our upcoming extensive review. 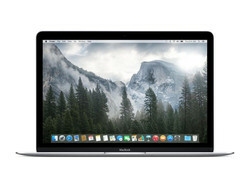 More than one month has passed since the first reviews of the MacBook 12 have been published. Many concluded that as long as the passive cooling system of the laptop, which is based on Intel Core M, is not confronted with overly complex applications, the device offered satisfactory performance. Apparently, the Air users were not content with the battery runtime while the display with a resolution of 2304x1440 pixels received overwhelmingly positive feedback. The new Force Touch TrackPad is another striking feature, which we have already examined carefully in our review of the Apple MacBook Pro 13. Apple's radical rationalization of the interfaces caused many controversies: Only one USB Type-C port is available, which is also responsible for charging the device. All technology aside, the availability of the MacBook 12 causes quite a bit of dissatisfaction. After more than 4 weeks of the device being released for pre-ordering in the online-shops, evidently there are still not sufficient numbers available. The current waiting time for shipment ranges between 3 to 5 weeks, and although selected Apple stores have exhibition pieces available, they do not have laptops for sale in stock. Inspired by its iPhones, Apple will offer its MacBook 12 in three different colors. 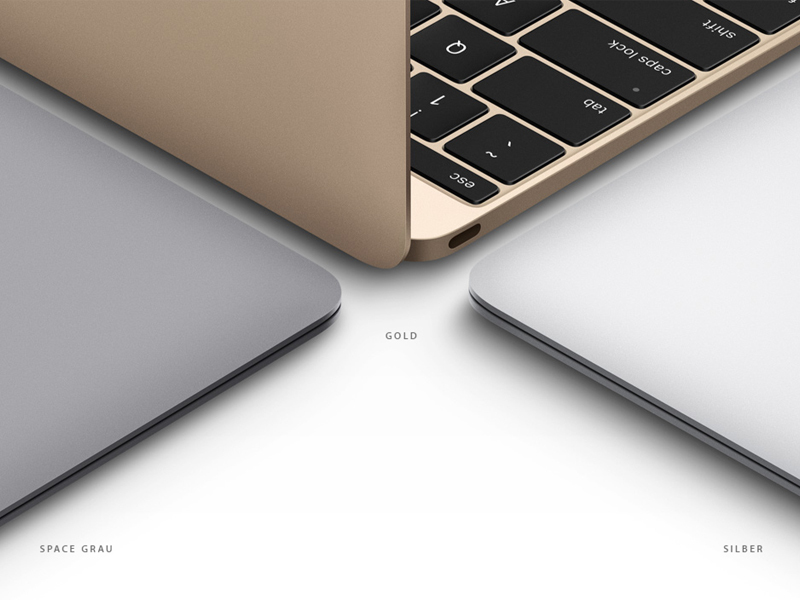 The choices are silver, which is the familiar look of the aluminum MacBooks, gold and space gray. Space gray, the design that we are reviewing, tends towards anthracite, while gold reminds us of champagne. The massive unibody concept remains unchanged. At a first glance, workmanship and stability appear to be immaculate and at the usual high standard. The comparison of the dimensions of the MacBook family turns out to be interesting: In terms of width and thickness of the laptops, the new MacBook 12 is currently the smallest member of the Apple family and beats the MacBook Air 11 by 4 millimeters (~0.16 in) and almost 2 centimeters (~0.8 in) respectively. How is this possible despite the larger display? Apple utilizes the available dimensions much more efficiently and thanks to a display frame that is only a few millimeters wide, it is able to shrink the dimensions of the laptop significantly. However, the familiar Apple logo on the back of the display is no longer illuminated. The reasons could be the especially slim display design, energy saving aspects or simply new design stimuli for future developments. "One for All" or "Good Bye MagSafe" is the new slogan regarding the connectivity of the Apple MacBook 12. The much-discussed USB Type-C port serves as power supply for the laptop, as well as connecting any external devices. How is this possible? It is achieved by either taking turns, or investing in an additional appropriate adapter. For 89 Euros (~$100) Apple offers, for example the "USB C Digital AV Multiport Adapter", which expands the laptop by a conventional USB port, an HDMI outlet and of course a USB-C port for charging the device. Fortunately, there are alternative suppliers for such adapters (however, they only offer one single USB port). Prices start at around 10 Euros (~$11). The good news is that you still get a 3.5 mm headset jack. The radical slimming of the MacBook 12 in comparison to the other Air models, has made it necessary to change the keyboard mechanics. The new "Butterfly Mechanism" is supposed to be superior to the existing technology. In practice, we are confronted with extremely short stroke distances, which will definitely require some time to get used to, even for Apple users. The positive aspects are the good balance of the keys as well as the crisp pressure point and the quiet stroke. Despite its slim architecture, the MacBook 12 is equipped with a backlit keyboard. The Force Touch TrackPad is identical to that of the MacBook Pro 13. It offers generous dimensions, reacts precisely, shows good gliding properties and the possible multilevel clicks are a great feature. With a resolution of 2304x1440 pixels, the Apple MacBook 12 says goodbye to the antiquated pixel grid of the Air 11 and Air 13 models. It is not only the resolution that bears positive news; our measurements verify the good results. A maximum brightness of 345 cd/m² is sufficiently bright for the panel, which convinces with a low black value of 0.32 and therefore a high contrast of 1065:1. The accurate color display is exemplary in the sRGB reference color space comparisons: A DeltaE of 1.6 in the ColorChecker and 1.9 in the grayscale places the MacBook 12 on par with the MacBook Pro 13. For our review, we have the base model of the MacBook 12, which is equipped with an Intel Core M-5Y31, 8 gigabyte of main memory and a 256 GB SSD. Current price in the online store: 1449 Euros (~$1650). Alternatively, for a surcharge of a 350 Euros (~$400) you can get 512 GB of memory space and the slightly faster Core M-5Y71. The device feels well rounded and smooth in our first test under Mac OS X. The high turbo speed of the chip seems to be capable of handling the occasional load peaks. The first test with Cinebench also confirms the installed CPU to be a solid foundation. In the multi-CPU test of Cinebench 10 the device lags about 11% behind the current Air 11 with an i5-5250U CPU. The result in the single thread rendering test is similar: 11% advantage of the current Air 11, "only" 33% for the MacBook Pro 13 with a 5257U processor. However, we also noticed the strong temperature/performance correlation. After repeatedly running the tests, we observed deterioration in the results. We will address this issue in detail in the upcoming extensive review. In terms of noise, there is not much to tell: The Apple MacBook 12 is the first of its kind that is completely silent under any level of load. Regarding surface temperatures, we observed that despite completely passive cooling in everyday use situations, the case to be evenly temperate. Under Boot Camp Windows, the device temperature is noticeably higher, which is also confirmed by higher consumption measurements in idle mode. Under consistent high load, the cooling concept becomes admittedly palpable and the aluminum device heats up noticeably. (-) The maximum temperature on the upper side is 45.7 °C / 114 F, compared to the average of 35.8 °C / 96 F, ranging from 22 to 57 °C for the class Subnotebook. In the first power consumption check, we measure between 1.7 to 6 watts (max. brightness, Wi-Fi modules on) while idling. Under load, we observe peaks of up to almost 30 watts, which level off at around 20 watts after a few minutes. This behavior could be due to the decreasing turbo clock speeds in reaction to the increasing heat output of the device. In terms of battery runtimes, the laptop indicates a forecast of more than 8 hours in WLAN mode when running under OS X. The detailed measurements will follow. After the first few days with the Apple MacBook 12, we can confirm the tendencies of previous reviews of the laptop. 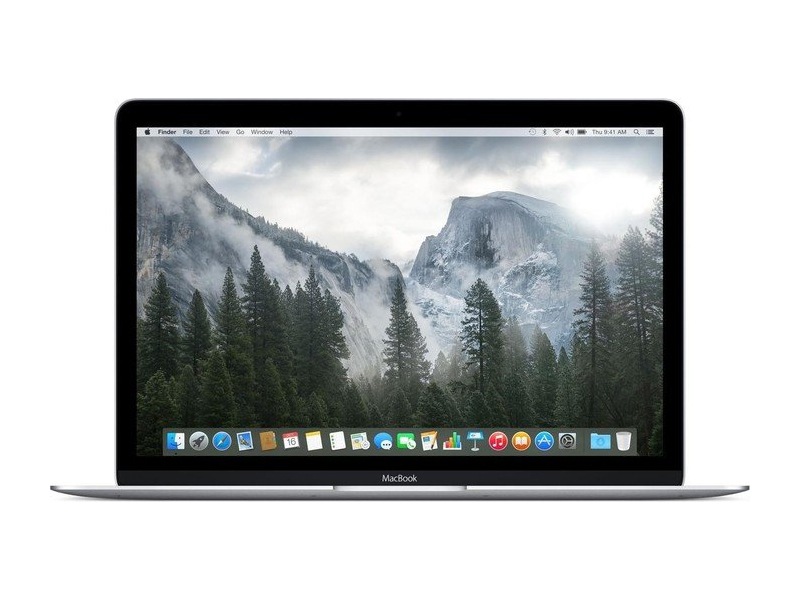 The MacBook 12 is an unmistakable offspring of the Apple hardware manufacturer in Cupertino. An almost perfect case meets superb display, successful technology-gadgets like the Force Touch TrackPad, are countered with erratic design decisions, for example the USB Type-C port. We are looking forward to more results and insights in terms of power in the course of our ongoing test. What can be expected from a passively cooled laptop, what are the limits during everyday use?